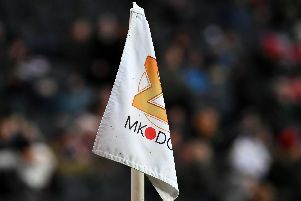 MK Dons couldn't deliver a repeat of their excellent first half performance as they faded to a 1-1 draw away at Fleetwood Town on Saturday. Taking on a team on an eight-game losing streak, Dons started brilliantly when Robbie Muirhead fired them into a 16th minute lead. But after Ike Ugbo missed a one-on-one chance early in the second period, Fleetwood struck back immediately through Ashley Hunter's spectacular effort and from there, there was only one side in it. Lee Nicholls needed to make three excellent saves to keep the home side out as Dons fizzled out, holding on to take their second point in a week. The result leaves Dons still mired in the drop zone, 22nd and five points from League 1 safety. Chuks Aneke returned from injury to go straight into the team as Dan Micciche made three changes to the side which drew 0-0 with Rochdale on Wednesday. Robbie Muirhead and Callum Brittain replaced Conor McGrandles and Aidan Nesbitt in the centre of the park. Fleetwood were the only team in League 1 to have a worse record than MK Dons, prompting Uwe Rosler's sacking last week. John Sheridan took charge on Thursday, but saw his new side go behind after 16 minutes. Ouss Cisse zipped a ball in towards Aneke, whose deft first touch played it into the path of Muirhead, who took a touch before bending it neatly past Alex Cairns from the edge of the box. Dons' struggles though, with one draw in their last seven games, saw them almost concede immediately but Conor McAleny was denied by the upright as he thumped the ball against the post from just inside the box. Lee Nicholls would be the busier of the two keepers in the first half as Fleetwood sought out the leveller, denying Kyle Dempsey and Ashley Hunter with fingertip saves. But with the lead, Dons eventually settled and played some nice stuff in the run up to half time. Aneke and Muirhead had efforts, but the stand-out was Callum Brittain in the centre of midfield. Popping up all over the field to collect and be an outlet, he also tracked back to his familiar right back to deny Hunter any space as he tried to stand up George Williams. Dons haven't lost a game when they have scored twice this season and should have doubled their advantage eight minutes into the second half when Ugbo ran half the length of the field, interchanging a quick one-two with Aneke before breaking into the area, only to be denied by a wise Cairns who was quickly off his line to deny the Chelsea loanee. And they would be made to pay. Fleetwood immediately broke up the other end, and picking out Hunter on the left flank, he bent in a wonderful strike past Nicholls' dive and into the top corner to the home side draw level. Both seeking their first wins in a long time, there was little caginess from either side but it was Fleetwood who looked most likely to take the lead. Dons struggled to clear a corner as it fell to Paddy Madden with his back to goal, but he in turn couldn't get the ball from under his feet despite being just a couple of yards out. Strike partner McAleney then drew another fingertip save from Nicholls as he shot first time on the turn. The home side continued to look the better as Dons shrank into their shells the longer the second half went on. With Aneke brought off, Dons opted to go long for Kieran Agard to chase but he had little fruit to work with. Nicholls needed to make another top save to deny McAleny, who deserved a goal for his persistence late in the day but the draw would ultimately suit neither side.